Born in Taiwan, Dr. Yang immigrated as a child to Argentina with his family. He moved to Southern California at the age of 18 to pursue his college education. Dr. Yang earned a B.S. in business and information systems from the California State Polytechnic University in Pomona and went on to receive his doctorate in optometry from the Southern California College of Optometry in 2006. He underwent extensive clinical training with an emphasis in ocular diseases at the VA Los Angeles Ambulatory Care Center and at the Indian Health Services Hospital in Lawton, Oklahoma. Dr. Yang is also one of Bakersfield’s elite optometrists that are licensed to treat and manage Glaucoma. After receiving his Doctor of Optometry degree, Dr. Yang joined a large refractive (Lasik) surgery practice in Los Angeles where he performed pre and post surgery examinations for two years. In 2008, Dr. Yang relocated to Bakersfield to join a Medical Group, where he provided comprehensive eye examinations, evaluations of ocular pathologies, and co-management of cataract, glaucoma, and refractive surgeries with eye surgeons. 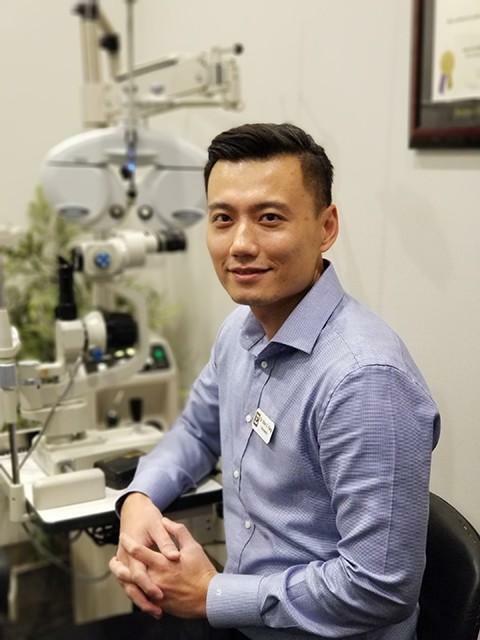 In 2012, Dr. Yang joined Bakersfield Eye Care Optometric Center and he is proud to offer his Bakersfield patients the most innovative eye care experience in a comfortable and professional environment. Dr. Yang resides in Bakersfield with his wife Olivia, daughter Miley, son Leo and their two cats, Miu-miu and Didi. He speaks fluent Spanish and Chinese Mandarin. Dr. Yang is a food and wine enthusiast, and he enjoys watching international soccer and traveling in his free time.